Whether you're an environmentalist or you simply want to save money on your next utility bill, you may want to make your bathroom eco-friendly. From the toilet to the bathroom's design, you can make your facilities green. Water constantly runs in the bathroom. Whether in the tub, the sink or the toilet, lavatory users constantly wash, rinse and flush. People may implement sustainable practices like turning the faucet off when tooth-brushing and taking five-minute showers. Additionally, though, they can invest in their fixtures to reduce their utility usage. A recent Cape Cod Times article explained that in Falmouth, Massachusetts, citizens have used their toilets to clear up the town estuaries. Septic wastewater increases the nitrogen levels in these water sources, and "Eco-toilets" that are either composting or urine-diverting limit the amount of nitrogen entering the estuaries. Composting toilets are totally waterless. Urine-diverting devices separate nitrogen-rich urine from the rest of waste, allowing for less to get into wastewater. "We hope and expect to discover that [eco-toilets] can reduce the amount of nitrogen from our septic system ... by something between 70 percent and 90 percent," said Win Munro of Falmouth's Water Quality Management Committee. In addition to compost and urine-diverting utilities, there are low-flow options, according to HGTV. Lessening the amount of water per flush, these toilets offer a more traditional alternative that is good for the environment. Avoid excess in your bathroom. A shower stall as opposed to a full bathtub takes up less space, and showers are more efficient than baths. Opt for a smaller sink, and don't run water continuously when brushing your teeth or shaving. Whenever possible, find ways to reuse materials. HGTV shows how you can install wood floors made from recycled material. 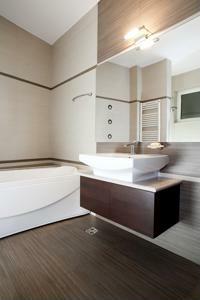 Tiles from natural stone are another environmentally-friendly option. In terms of accessorizing, shop at second-hand stores for bathroom odds and ends. From the shower curtain to the soap dish, you can find gems that will accent your bathroom distinctively, as items from a thrift shop are almost always one-of-a-kind. Finally, impress the environmental theme with nature-based decor. Put some plant-life in your bathroom. Make sure you have a few windows to allow sunshine to filter in. Use natural tones in any paint or tile decisions you make. These design choices, coupled with eco-friendly utilities, will satisfy any nature-lover.